There isn’t a scrap of drywall to be found in this Wisconsin full-log homestead. What happens when an all-American couple wants the quintessential American house? Nothing short of perfection. But like many things worth waiting for, perfection doesn’t come quickly. 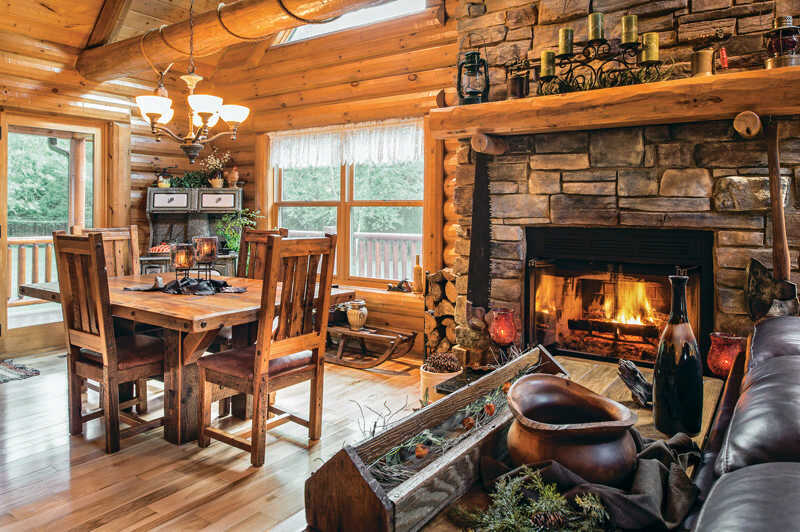 The owners of this 3,270-square-foot log homestead spent more than a decade planning and preparing for their house. First they purchased 14 acres in Wisconsin Rapids. When the deed was free and clear, they invested in well and septic installation and cleared the land in preparation for construction. As they paid each component off, they gained equity with the bank, making it easier for them to secure a construction loan when the time came. 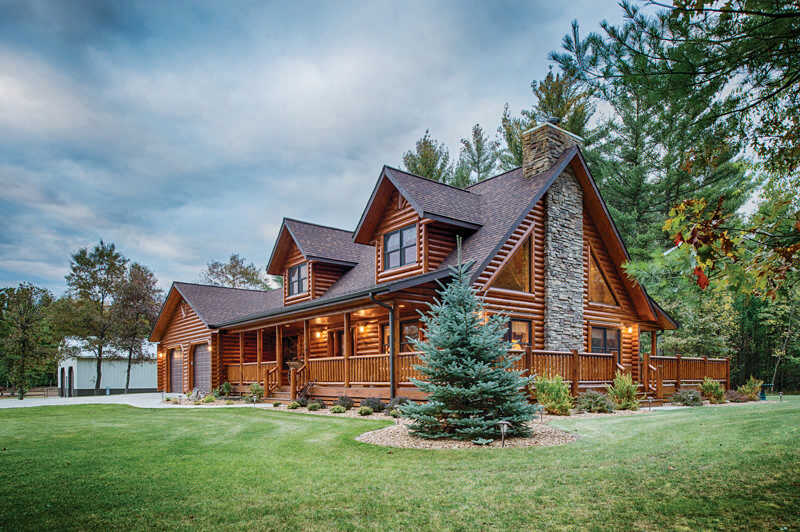 Their journey led them to Wisconsin’s Golden Eagle Log & Timber Homes. 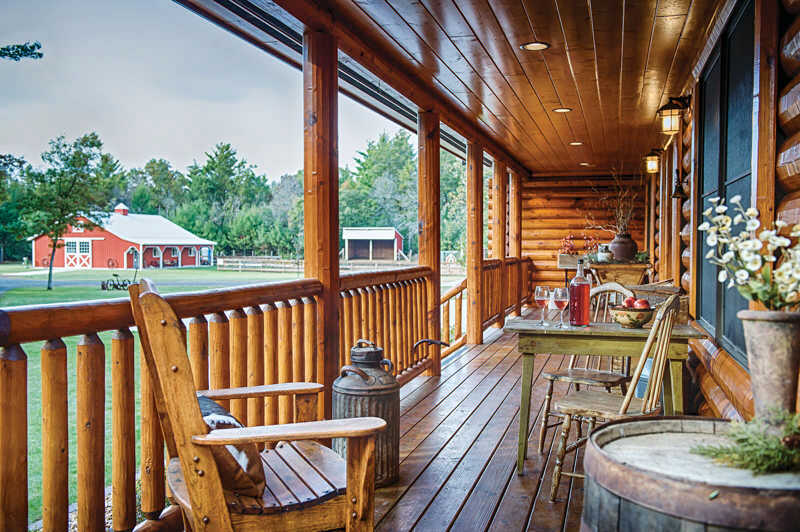 Not only does the company offer log home manufacturing and construction services, its design center enables buyers to select everything from windows to doorknobs right at their facility. This easy, one-stop-shop approach appealed to the young couple. 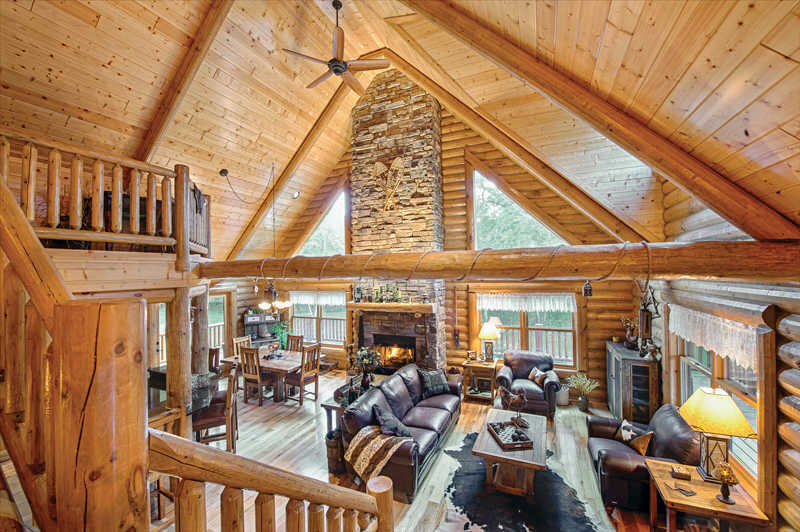 The three-level, three-bedroom/three bath log home they designed is wood to its very core — there isn’t a scrap of drywall in the place. 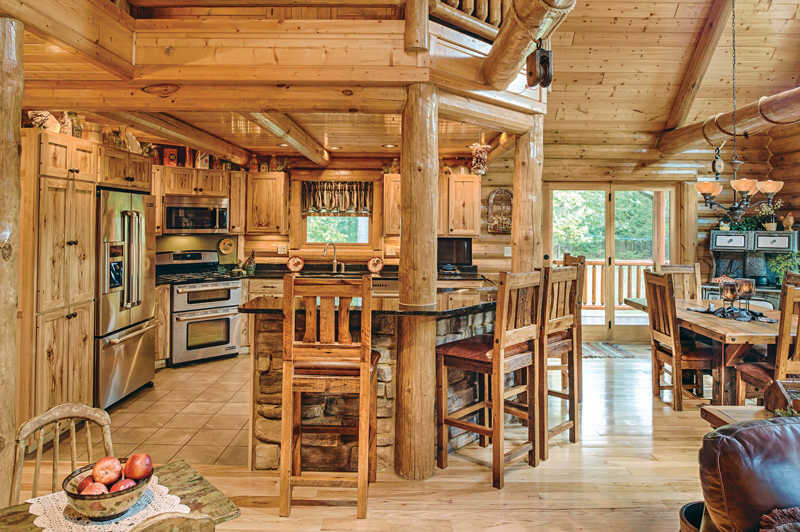 Golden Eagle Log & Timber Homes’ 8-by-8-inch “super round/double round” log package with full saddle-notched corners provides the canvas for the custom floor plan. The exterior is stained in “Teak” by ProLuxe Wood Finishes, and the interior in a shade called “Capture Hazelnut” by Sashco. 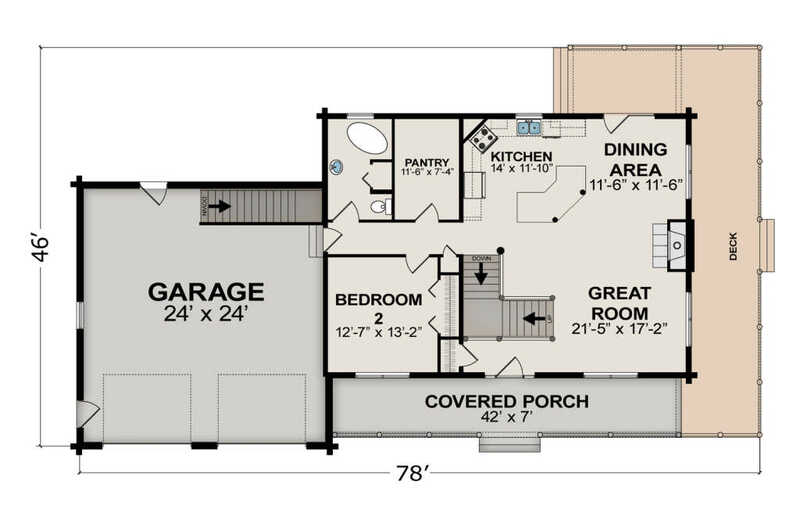 The sizeable kitchen boasts a huge pantry constructed of 2-by-12 rough-cut boards. Hickory flooring can be found underfoot and in the kitchen cabinets, which are topped with jet black granite. A split-log stairway rises to the loft that doubles as an office and provides access to the private master suite. A false dormer allows for maximum natural light and expansive views from the upper level. A 42-inch-wide wood-burning fireplace is faced in “Shannon” ledgestone, which also encases the back of the kitchen island. The fireplace isn’t the only thing keeping this house toasty during frigid Wisconsin winters — the entire home, including the garage, is equipped with radiant in-floor heat. Outside, wide covered porches in the front and back of the home are connected by an exposed deck on the side, offering several comfy spaces to soak in summer’s warmth. The home’s features combine to create a welcoming atmosphere for occupants and guests. It’s a testament that if you craft a plan and have a little patience, log home ownership can be a reality for all who dream of it.